Hlengiwe is the petite mother of three children aged 11, 7 and 4. She is 27 years old and her amazing rise out of her hard start in life is an inspiration. At a very young age her mother died and she has no memory of her mother. She was then sent to her uncle and he could not afford to pay her school-fees beyond her second year of school. At the age of thirteen she was sent to be a nanny for other people and thereby earn her own keep in terms of food and clothing. In the year 2001 she attended course one and two in sewing and started working for us in 2004. She wants nothing more in life than to be able to build her own three roomed house for herself and her children. At present her children stay with her aunt while she earns an income working with Fancy Stitch in the week, paying rent for her one room accommodation with no running water or electricity. 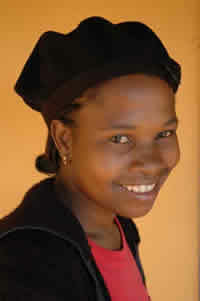 Hlengiwe is a little dynamo of energy and ideas.